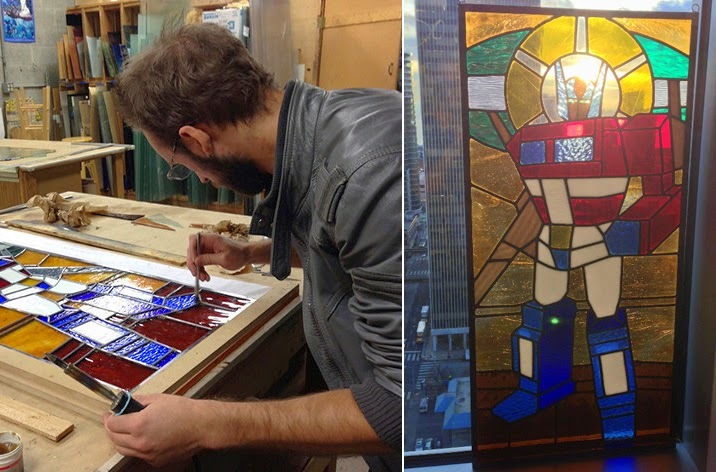 Craig Kovatch's first EVER stained glass project, this Optimus Prime stained glass window is a 122 piece success. A software engineer by trade, this work is so good it makes me want to shatter all the windows in my house, just to ensure he can keep the awesomeness going (or at least make Soundwave - I have limited windows). I would read the HELL out of Ultimate Bible. In fact I might just write it but my version will include Iluvitar, Superman, Luke Skywalker & Cthulhu. The stained glass Optimus Prime is epic. I hope he does Superman next, especially in his current New 52 costume which I think is best. Thanks Pensol - like the Ultimate Bible cast choices there!